BURKES PEERAGE, LONDON, 1921, P. 324. COLONEL FRANCIS CHARRINGTON (1858-1921), C.M.G., OF PISHIOBURY PARK, HERTFORDSHIRE WAS THE THIRD SON OF THE SPENCER CHARRINGTON M.P. (1818-1904) OF HUNSDON HOUSE. 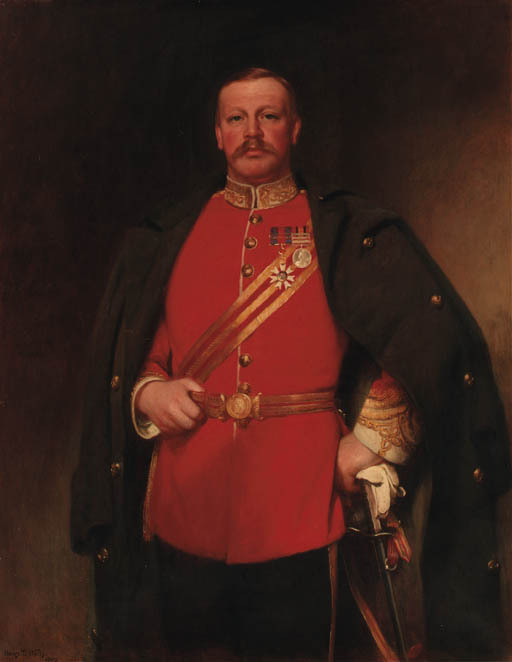 THE COLONEL EARNED MEDALS FOR HIS EFFORTS IN THE SOUTH AFRICAN WAR (1900-1901) AND THIS PORTRAIT WAS PROBABLY COMMISSIONED TO COMMEMORATE HIS DECORATION.